'Adopting' Masterpieces: Touch of Class Or Crass? Getting your name on something at an art museum usually requires a fat bank account. Leonard A. and Evelyn Lauder donated $5 million to have the Whitney Museum of American Art's fifth floor named after them. Samuel J. and Ethel LeFrak gave $10 million to have their names put on the rotunda of the Solomon R. Guggenheim Museum. At the Metropolitan Museum of Art, simply endowing a curatorship costs more than $500,000. Then there is the Brooklyn Museum of Art, where having your name on a label next to a painting now costs just $500 a year. Under a program that began with a mailing to 15,000 people on May 1, the museum is urging its members and visitors to "be a modern-day Medici" and "adopt a masterpiece" from its permanent collection. If $500 is too much, two people can sign on for $250 each. They can even adopt a work in memory of someone. "I hope it might involve several hundred people eventually," said Arnold L. Lehman, the museum's director. Each work that is chosen -- "adopted" is a bit of a stretch, because the money goes into a kitty for research and conservation of the museum's holdings, not toward the upkeep of a particular work -- will get a new wall label. It will go just below the one that gives the names of the work, the artist and the donor, and say, in the same size and style of type, "This work of art has been 'adopted' in 1999 through the generosity of . . ."
The program, though, is raising eyebrows -- and questions. Does it, as a few people believe, bring to the museum a populist touch of mass? Or does it add a gratuitous touch of crass? Will other museums feel compelled to follow? The critics say the program furthers the notion that art is a commodity -- by their definition, something judged by its worth in the marketplace instead of its intrinsic intellectual or esthetic value. And they say the program lacks dignity and cheapens the museum atmosphere. "It's the ultimate mixing of commerce and the heavenly," said Stephen E. Weil, a senior scholar at the Smithsonian Institution's Center for Museum Studies. That kind of talk angers Mr. Lehman. "All of these people are too uptight," he said. "Museums are not bastions of peace, quietude and order. That's an elitist attitude and it's something we want to stop. It's really annoying, when we're trying to bring people into the building, to be told that this is tawdry." Mr. Lehman, who holds a Yale Ph.D. in art history and became director two years ago, sees "adopt a masterpiece" less as a way to raise money than as a way to get more people involved with art. Attendance at the Brooklyn museum, in contrast to the rising tide at most other big art museums, was stagnant for many years, at about 300,000 annually. Then Mr. Lehman arrived, with new ways to attract visitors, including "First Saturdays," a monthly event that waives the admission fee, keeps the museum open until 11 P.M. and offers music and dancing as well as art. Attendance in the last fiscal year was 585,000, helped by a big Monet exhibition. Financially, the museum is also doing well and will end its fiscal year on June 30 in better shape than its budget expected, though a spokeswoman declined to provide details until the board reviews them at its next meeting. Lately, Mr. Lehman has even begun to think about expansion. "No question, we are going to do a capital campaign soon," he said. "Adopt a masterpiece," the first move during Mr. Lehman's tenure to attract dispute, seems to be a first in the museum world, though not elsewhere: programs to adopt a highway or a tree abound. New Jersey Transit offers its train stations for adoption, the Central Park Conservancy lets people sponsor park benches and Rutgers University has let donors put their names on lockers in the football team's locker room. No one seems annoyed by signs along a highway or plaques beneath a tree. And Mr. Lehman pointed out that schools, synagogues and churches sometimes engrave donors' names in stone walls and on pews. But critics argue that art is different, an expression of genius that is supposed to elicit thought and feeling. Museums always like to pretend they are above the commercial realm, though in reality they are knee-deep in it, busily creating items for their museum stores, promoting their restaurants, renting out space for private events, selling corporate sponsorships and otherwise trading in the marketplace. And as they raise money, most nonprofit organizations, including museums, offer naming opportunities to donors; adopt-a-masterpiece simply takes the concept to a new level. "People look around and see names like Morgan, Vanderbilt and Whitney on things," said Mr. Lehman, "and now they can say: 'I can do that. I can do something that's valued, too.' For them, maybe this is their first step toward philanthropy, and maybe in 20 years they'll give a huge contribution." So far, about a dozen would-be Morgans from Brooklyn, Manhattan and Westchester have adopted artworks, said Peter B. Trippi, the museum's vice director for development. Sherry Mallin, a 65-year-old self-described "professional volunteer," and her husband, Joel, a lawyer, are an example. "I thought it was a great idea," Mrs. Mallin said. "I do fund-raising for other museums and I thought this is novel, this is new. We collect contemporary sculpture, and we know that conservation and maintenance is costly and ongoing. So this has appeal." Mrs. Mallin and her husband chose a small model, known as a maquette, for Rodin's "Burghers of Calais." Another donor, Sue Stoffel, a 41-year-old mother of three who is already a member of the museum, said she "jumped on" the offer as a way of increasing her support. 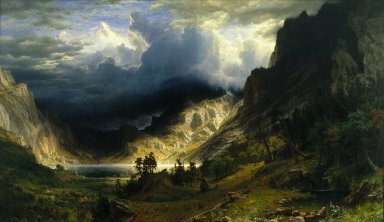 Having recently moved to Scarsdale, N.Y., after years of living in Switzerland, she picked "A Storm in the Rocky Mountains" by Albert Bierstadt, in part because "it looks very Swiss" and her husband is Swiss. An obvious enthusiast, she said, "I will take my children and show them and I will tell everyone about this." Among the other works chosen by donors are Georgia O'Keeffe's "Brooklyn Bridge," George Caleb Bingham's "Shooting the Beef" and a mid-19th-century wood Luluwa sculpture of a maternity figure from the Congo. Mr. Trippi, who started the program, said he had decided to try it when a look through the files turned up a half-hearted, early 90's version of it. The museum had just completed renovating its west wing, and as artworks were installed in the new galleries, it had asked several donors and members to contribute $1,000 to sponsor an object for three years. About 50 people did; each was cited as a sponsor on a wall label that came down in 1996. Mr. Trippi and Mr. Lehman decided to revive and revamp the idea with a populist cast. They had 17,500 postcard solicitations printed and mailed or distributed at the museum. "It's now open to everyone," Mr. Trippi said, "and we tried to make it more enticing." Besides being noted on the wall label, participants will receive an adoption certificate and a tour of the object's gallery with the relevant curator (American art, African art, European art, depending on the adopted work). Those who pay $500 a year are also given membership in the relevant art council, a museum group that is invited to gallery tours and lectures. "I envision this as a populist program to tie people to the collection," Mr. Lehman said. "I hope they'll think of the object as a member of their immediate family. I'd love it if people came and had their pictures taken with their objects, and brought their friends to it and said, 'That's my painting.' That's the kind of pride I want to encourage. "I guarantee," he added, "that in the future a lot of institutions will be doing it." Nonprofit organizations everywhere are looking for ways to recognize donors. So far, $500 has not bought much other than a place on a published list of contributors. Emily K. Rafferty, vice president for development at the Met, said she doubted that it would follow Brooklyn's lead. "It's not a concept we've explored so I can't say we'd never do it," she said. "And I certainly respect what works for each institution. But the concerns I have are that we may have donors that have given the works or given money to purchase the works, and their names are on the labels. We wouldn't want to confuse that." The Met, with its wealth of donors, may not be typical, though. Other museums are in a less enviable position. Mr. Weil of the Smithsonian, for one, is sure that the idea will spread. "Anything that's meretricious is copied," he said.